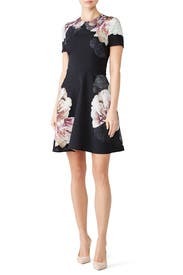 Bold photo realistic blooms enliven this sweetly feminine fit-and-flare dress by Black Halo. 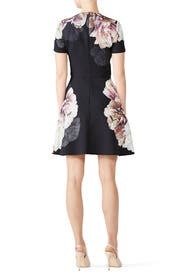 Black floral printed crepe (97% Polyamide, 3% Elastane). Hourglass. Short sleeves. Crew neckline. Hidden back zipper closure. Fully lined. 36" from shoulder to hemline. Made in the USA. 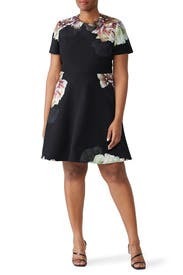 Absolutely perfect for work and would be great for a daytime event too! The fit of this dress is perfect. 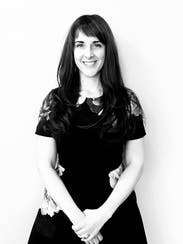 Very slimming where the seam hits the waist, very fitted up top and a great length for work. And it had a hidden surprise, POCKETS! I love this dress and would definitely rent it again. Highly recommend this dress. There was an issue with having to fight with the zipper, which kept getting stuck. Once I was able to zip it up, it bunches up on the right side, which made it look awkward. The fact that this dress has pockets is amazing. Too bad I didn't get to wear it. Comfortable, beautiful, got many compliments. wears well, flows well. This is a dress I would own. 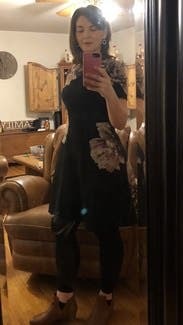 It fit well overall, it's a great dress. Classic black with a lovely floral twist. I loved this dress! As an hourglass shape, it contoured nicely to the smallest part of my waist. The length was perfect. I was afraid it would be a little short on me, but made my legs look long and amazing. The pockets were a plus. It was comfortable all day at work and felt dressy enough for an after work function. 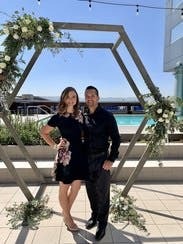 Everyone asked me where I got this dress! I mostly really liked this dress. 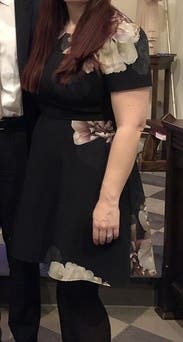 I don't love the way most things fit my postpartum body, but this dress was definitely more flattering than others through the bodice and skirt. My only complaint was that I didn't like the shoulders/sleeves. I felt like they emphasized my larger arms. Overall though, I felt good and received compliments each time I wore the dress. Nice print but I wound up not wearing the dress because it was too tight in the arms/shoulders. Sent back because it was too small to wear at all comfortably. One size bigger would have been perfect! Beautiful fabric and loved the print. Only downside was tight through arms/shoulders. Really lovely dress. Great lines and pockets to boot. A bit longer than usual but made for some drama. Awesome dress but too small to wear! From what I now understand, after reading lots if reviews, Black Halo runs small. I should have ordered a size up in this dress but I did not. I'm going to reorder in the correct size. Loved this dress! Very flattering and fun to wear a print without wearing a large print! A bit tight in my chest but ran TTS other than that. Would rent again. 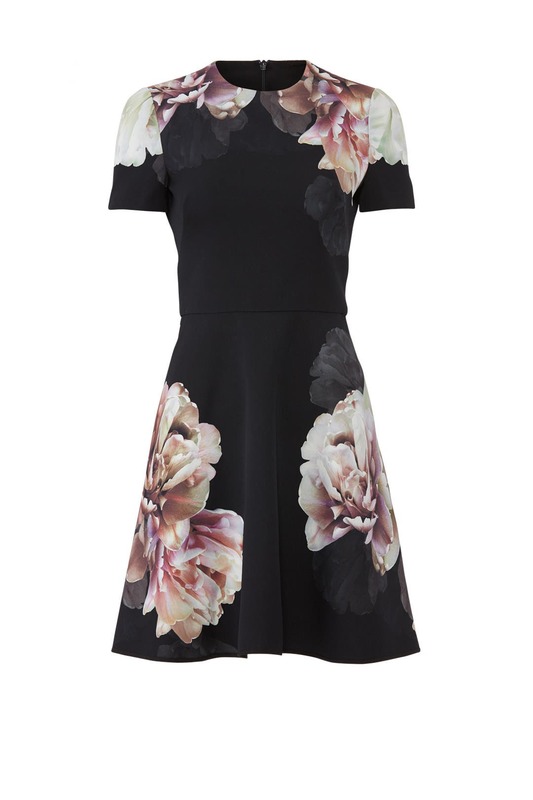 Cute LBD with florals. I sized up from a 4 to a 6, and it fit perfectly. The 4 would have been too tight in the chest and shoulders. It was really comfortable to wear and flattered my figure. Lots of compliments and I felt very confident. Very cute dress! Lots of compliments. 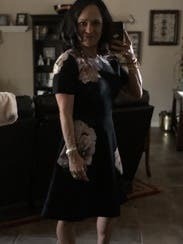 Loved this dress. It was perfect for a conservative office yet with a fun twist with the flowers. I sized up as usual for this brand and the size 6 fit great with enough give. Did not wear, felt too tight around the chest. The zipper is VERY difficult as other people mentioned. The high neck and sleeves felt matronly to me. Super cute dress. Wore it with a black motorcycle jacket. Totally didn't take a picture to show how cute. A little tight on the top part. Had to really smoosh my chest into it. This was the perfect dress for a daytime spring wedding! So comfortable and I got so many compliments. Runs large so get a smaller backup size. I didn't want to send it back but did reluctantly. 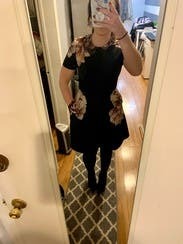 Finally, a black halo dress that fits me! Dream dress. 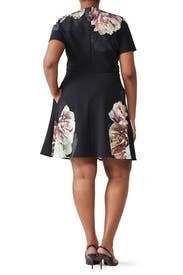 Classic A line, tailored to a tee, with pockets and a gorgeous floral design. I'm so sad to return this one. Hits at just the right place on the hips, length was perfect on my 5'6" frame. Highly recommend this one! this was a semi formal wedding in a barn/venue. not terribly formal, but not casual either. This felt snug in the ribs and shoulders. but it has the tiniest bit of stretch, so it was manageable. I thought it hung beautifully in all the right places. I'm typically not one to get clothes that I haven't tried on, but really didn't want to acquire a dress for one time use.